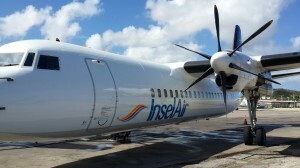 PHILIPSBURG, WILLEMSTAD - The 32 passengers of InselAir flight 7I 512 from Sint Maarten are brought to Curaçao today. Yesterday the Fokker 50 from the local company made a precautionary landing after departure because the aircraft had problems with one of the engines. The technicians are currently working on it. InselAir can carry out its flight schedules with two other aircraft.